“A battery-powered vehicle having a fire incident is newsworthy. A gasoline-powered vehicle having a fire is newsworthy only if it stops traffic,” said Steven Risser, senior research leader at Battelle, a nonprofit research and development firm, in a May 17, 2018 CNNMoney article. Data from the National Fire Protection Association confirm Risser and Smyth’s observations. In 2015, there were more than 174,000 vehicle fires in the U.S., with nearly all of them involving conventional, gasoline vehicles. That’s about 17 every hour! And Tesla claims that their vehicles have driven more than seven billion miles with only 40 fire incidents. 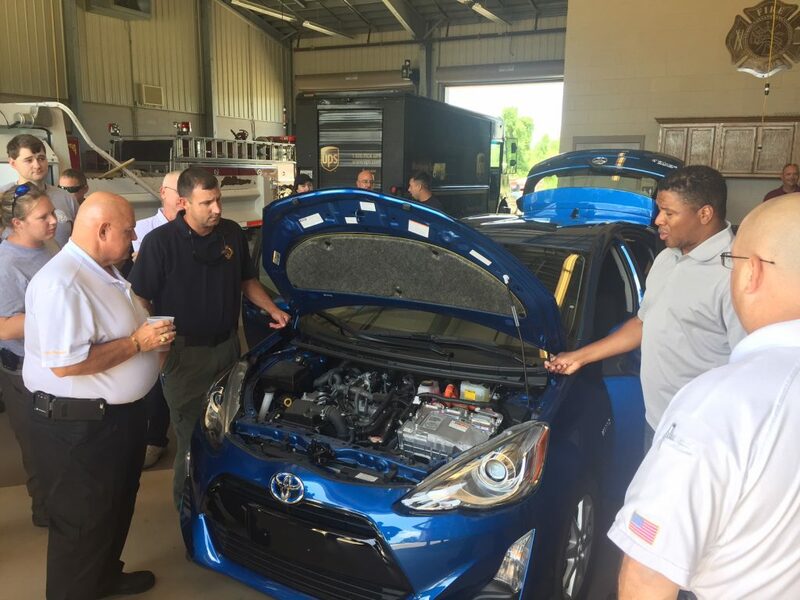 NAFTC Instructor Chris Womock teaches a workshop for first responders to learn to deal with incidents involving electric vehicles and other AFVs. Credit: NAFTC. While electric drive vehicles are at least as safe as those powered by gasoline or diesel, they are different. Firefighters and other first and second responders should be aware of these differences, and how to safely deal with them. Electric-vehicle battery packs consist of hundreds or even thousands of battery cells, each containing a flammable liquid electrolyte. A lithium-ion battery fire is usually due to a short circuit within one or more of the battery’s cells, which generates heat. The heat from the short circuit can then ignite the chemicals within the battery, leading to problems in the adjoining cells and a condition known as “thermal runaway” where the fire spreads and builds. In most cases, these fires are the result of a collision of some sort. In fact, Jeff Dahn, a physics professor at Dalhousie University, reports that battery fires traceable to a manufacturing defect occur only about one time for every 100-million lithium-ion cells. Therefore, the Tesla fire in West Hollywood cited above, if the accident analysis shows it was spontaneous, can indeed be characterized as the freakiest of freak accidents. The main difference between gasoline and battery fires is that gasoline fires happen as soon as there is an ignition source. Battery fires typically take more time to achieve the necessary heat for a fire. The upside to this is that it gives the car’s occupants time to exit the vehicle before the fire gets out-of-hand. The downside is that a battery can be damaged—as with a Tesla that ran over debris in Washington State in 2013—but the driver doesn’t notice the problem until later when the flames become visible. 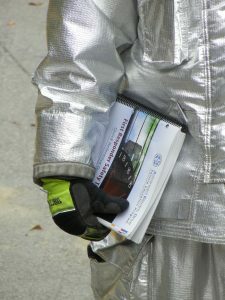 For firefighters and other first responders, a battery-powered vehicle fire poses a unique set of problems. If the battery is not burning following an incident, the central concern is to keep the electrolyte from catching fire. If the battery is on fire, the concern then becomes one of keeping it contained. The high-voltage wiring in these vehicles is another key safety consideration. Even though a vehicle battery fire is rare, manufacturers continue to improve safety. New battery packs are encased in hardened aluminum and improved firewalls are installed between the pack and the passenger compartment. Tesla has updated the suspension on the Model S so that it rides higher at highway speeds, reducing the risk of debris hitting the battery. In the future, designers hope to replace the flammable electrolytes with a non-flammable variety. For now, though, battery-powered vehicles continue to obtain the highest NHSTA safety ratings, meaning you can drive your electric car with no more worry that your old gas one. * This article covers incidents involving battery-powered vehicles. There are specific concerns for other alternative fuel vehicles that are outside the scope of this overview.